TASK: Contingency for Borg cube - Bombard Earth in the past; stop first contact. Borg Queen commands. Special skill(s): May be reported aboard, carried aboard and launched from any one of your Borg cubes. Temporal Vortex. Point-Box on card: 15 bonus points (your opponent can score points, when you use this card). - Queen's Borg Sphere (20 V 17) from Resistance is Futile! 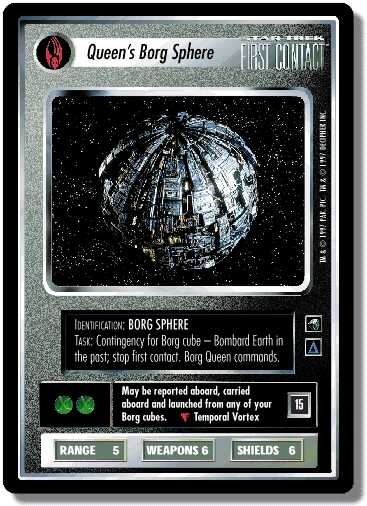 There are 44 entries for Queen's Borg Sphere (ST1E 4 R 125) at the Tradeplace (72 haves and 6 wants). Click here to see all trade list entries for this Rare card!